Carmine is a natural colorant derived from the cochineal insect Dactylopius Coccus Costa which grows on cacti in Central and South America. Nowadays a large part of the cochineal comes from Peru where it grows in nature as well as on plantations due to the ideal climate of the country. Out of cochineal with water extraction a solution of Carminic acid is obtained. With further purification a stable water soluble Carminic acid is obtained. When Carminic acid reacts with calcium and aluminum a Carmine lakes are obtained. 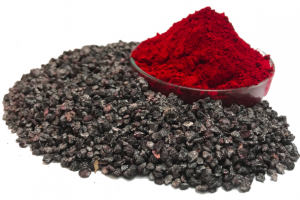 Cochineal extract and carmine are natural anthraquinone red colors. Depending on the extraction method, water or alcohol different shades of the carmine pigment can be obtained, ranging from bright “strawberry” magenta red in low PH to “blackcurrant” purple in high PH. Carmine has excellent heat and light stability and is used as food coloring in; processed fish and meat, confectionary, dairy, bakery, snacks, juice drinks and healthcare & cosmetics. RAZ and RAM are type 2 products which contain 4-Amino Carminic Acid as principle colouring and according EU Regulation are not allowed to be labelled as E120 and used in Europe. For usage outside Europe recommended to consult the respective local legislation. BioconColors is a leading producer of natural colors specialized in a wide range of Cochineal, Annatto and Paprika derivatives. With more than 35 years of experience, BioconColors supplies the food, beverage, cosmetic and pharmaceutical industries worldwide.